Life in Sapporo Hokkaido, Japan: Ramen In Summer? It's 29 degrees and I am missing my ramen. 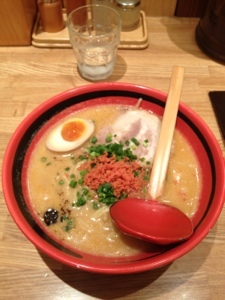 Go to a ramen shop in the summer and cold ramen dishes are a hit, unless you are like me, I still prefer a hot ramen. I was heading back home to Sydney mid July and couldn't resist the temptation of having a ramen at New Shin Chitose Airport. The first ramen shop on the right as soon as you enter ramen area does the best prawn base soup ramen, despite the hot summer I always manage to even finish the soup as well. Give it a go whenever your at the the airport in Sapporo. I just stumbled upon your blog and I think it's really insightful and enjoyable. As for 29 degrees, I'd say that's perfect weather for hot ramen. Where I live, it's consistently 100F (~37C) and that pretty much ruins any appetite I have for anything with a hot soup base.